Emeralds are the birthstone for May and the traditional gemstone for the 20th and 35th wedding anniversaries. They are considered one of the four precious stones along with diamonds, rubies, and sapphires. The lush greenness of this stone makes it a perfect gem to celebrate birthdays and anniversaries in this beautiful month when nature springs back to life. Emeralds have a long and rich history. They have been beloved by English royalty and Turkish sultans, and treasured by the Aztecs as a holy stone. 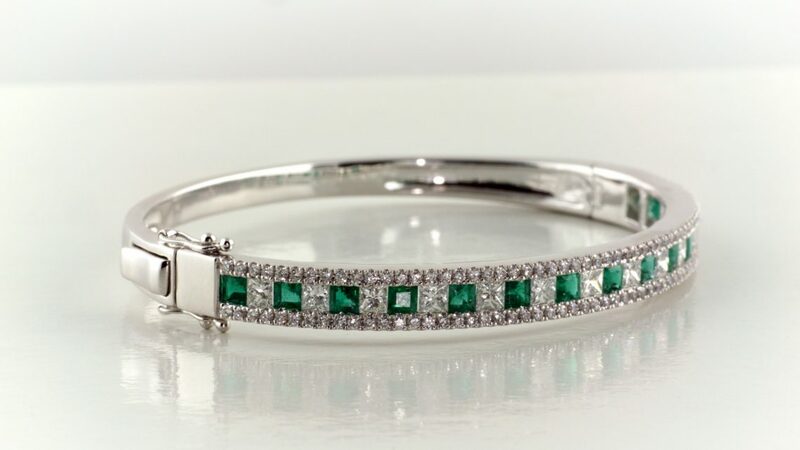 Mined as early as 330 BC in Egypt, that most famous Egyptian pharaoh, Cleopatra had a passion for emeralds and used them as part of her royal ornamentation. 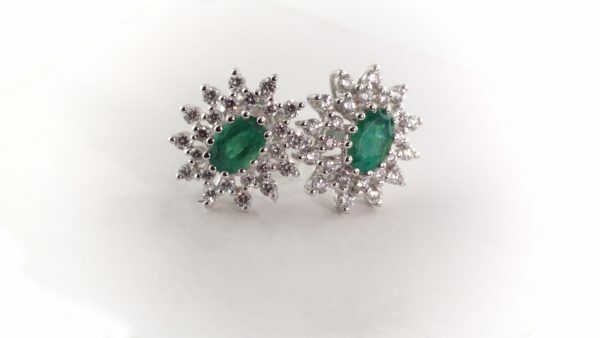 Emeralds promise good luck and enhance well-being according to the Vedas, the ancient scriptures of the Hindus. And legend says that King Solomon received an emerald as one of the four precious stones given to him from God. The stones were meant to bestow him with power over all creation. The finest emeralds are transparent, making these stones the most valuable. A dark slightly bluish green is most desired. While emeralds are often clouded by inclusions, this is not necessarily seen as a fault. Rather these natural characteristics testify to the genuineness of the stone. The emerald cut, with its step cut facets in a square or rectangular shape, was specifically developed to highlight the beauty and color of this gem. Due to their inclusions, emeralds tend to be naturally brittle and sensitive to pressure. Giving a bit of extra care to your emerald is well advised. Keep it away from harsh chemicals and remove when exercising, cleaning or engaging in other types of strenuous activity. 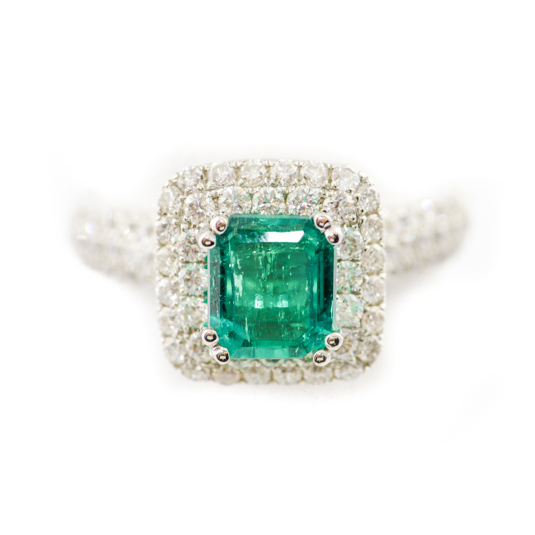 Emerald belongs to the beryl family and is its most prestigious member. The beryl family includes aquamarine, a beautiful stone renowned for its blue color, and precious beryl that refers to all color varieties of beryl that are not emerald or aquamarine. Morganite with its soft pink or salmon color is an example of a precious beryl. Age of oldest emeralds? 2.97 billion years (found in South Africa). Largest emerald ever found? The Bahia Emerald. This stone was discovered in 2001 in Brazil. It weighs 840 lbs, contains an estimated 180,000 carats and is valued at $372 million. Where can significant emerald deposits be found? Today significant deposits can be found in Colombia, particularly north of Bogota. The mines here yield high quality stones of a deep green color. 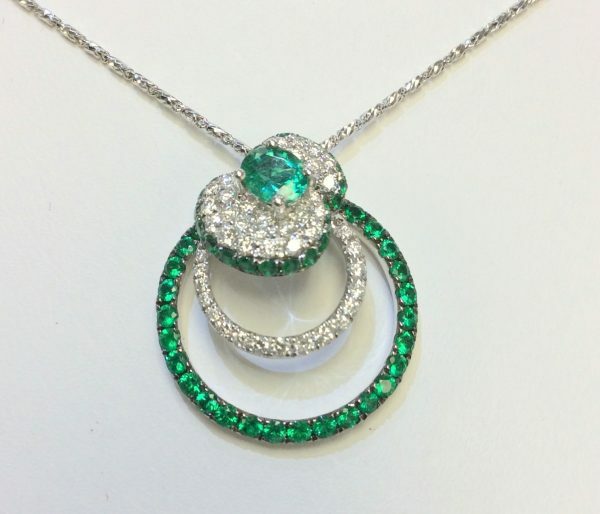 Please stop by our shop if you are in the Buffalo, NY area to see our selection of emerald jewelry. Or, take advantage of our custom jewelry design services to create a special piece just for you! We look forward meeting you soon.